Ask fellow campers about "Asessippi Provincial Park" and nearby attractions. Rate shown does not include the $5 CAD park entry fee. The campground office is several km from the entrance to the park. It is located next to the Bay 1 campground section. There are five sections called Bay 1 to 5 as well as 4 group camps and three overflow areas. We were in Bay 5, the closest campground to the beach and concession area. Our site was a slightly unlevel gravel back-in surrounded by forest for good privacy. The only hookup was electrical and it worked fine. Water fill up was back near Bay 1 and the office. Other water taps are situated throughout the park. The park has two dump stations near Bay 1 and Bay 5. The one at Bay 5 had no potable water. There is a table and fire grill included at each site. Washroom facility and pay showers were located in the middle of Bay 5. Other washrooms are in each campground loop. There was a nearby playground, but it was relatively quiet at our site. No OTA TV or Wi-Fi. There were too many trees around our site for satellite TV. There is a trail from Bay 2 through Bay 5 that leads to the beach and concession. The beach is down a series of stairway steps. 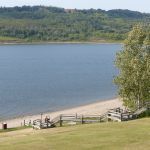 This is another good provincial park that is worth a stay. 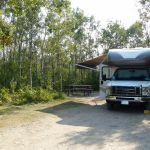 We camped at Asessippi Provincial Park in a Motorhome. Are you affiliated with Asessippi Provincial Park ?